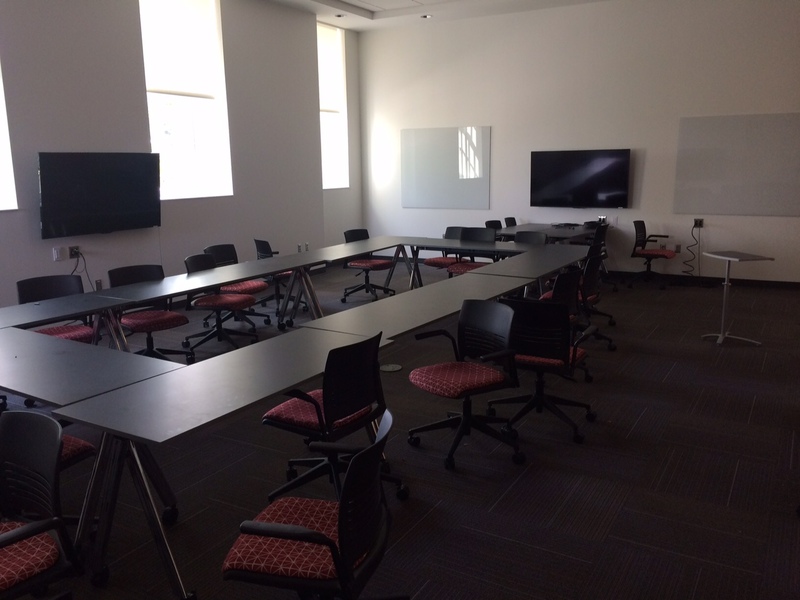 The classrooms in Merrick Hall have high-end technology, especially in 204, which is specifically designed for collaborative group work. This room has Sharp Aquos smart TVs on all four walls with flexible tables and chairs for various classroom configurations. The TVs are all connected to a central control system, allowing groups of 1-4 to work independently, the instructor to present on all four displays, or the instructor may select any of the other TVs’ input to be displayed on all four screens. 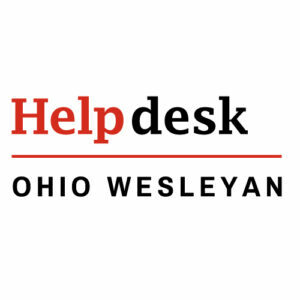 There is also a Samsung Blu-ray/DVD player in the lectern cart that may be connected to the instructor’s input or any other TV’s input. However, the player has its own HDMI cable, which must be plugged into the wall. The HDMI cable for laptop connectivity must first be unplugged. Please plug the original cable back in when you’re done with the player’s. Here is a link to the User Manual for the player. »The input to the TV will always be HDMI3, even though you might actually be using VGA. Remote controls are not available for these TVs. Do not change the input on the side of them. 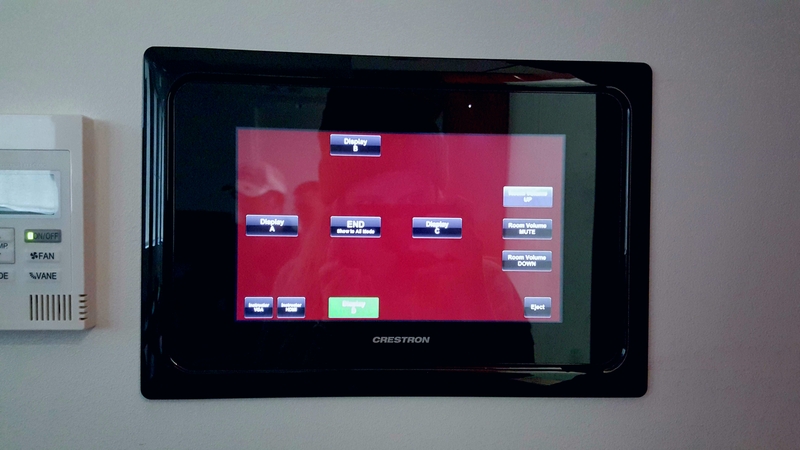 »In order to use the instructor’s inputs (on the far wall, between screen D’s inputs and the touchscreen control panel) the system must be in Show to All Mode: Instructor VGA or Instructor HDMI. If the system is set to display one of the other screens to all or if they are each displaying independently, the instructor inputs will not work. »As the video, so with the audio. When the system is in Show to All Mode the ceiling speakers are engaged. When each screen is working independently, the ceiling speakers are off. The instructor’s audio will only be heard in Show to All Mode. Press the Display ON or Display Off button on the white control plate under the TV. Please remember to turn them off at the end of the day. Touch Instructor VGA or Instructor HDMI at bottom left on the control pad. Touch the appropriate Display A, Display B, Display C, or Display D button on the control pad. 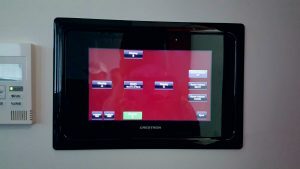 (The control pad is configured such that, if you eject it from the wall and turn around, the arrangement of the buttons matches the arrangement of the TVs as you’re looking at the class.) Note that the system will expect whichever input was last used on the TV. Touch the END Show to All Mode button in the middle of the control pad. Touch the appropriate button on the right of the control pad. Press the Volume UP or Volume Down button on the white control plate under the TV. Press the appropriate input button on the white control plate under the TV, either HDMI or PC/VGA. Touch the Eject button at bottom right on the control pad and enter the numeric code. »Please note that it may take several seconds for the display screens to respond to a command from any panel or pad, and that one or more might respond quicker than the others. This is normal. Solution: Select the appropriate display mode on the touchscreen panel. Solution: Select Displays from System Preferences. Click the Arrangement tab along the top. (Don’t see Arrangement? Then the Mac isn’t recognizing any external display connection.) Then check the box next to ‘Mirror Displays’ along the bottom. Solution: Press Windows key + P to toggle display modes. Solution: Use the Input button on the side of the TV to set HDMI as the input. Solution: Try hooking up to a different TV’s input cable. Try using a different adapter. Solution: Unmute and/or turn up the volume on your device. Solution: Remove the audio cable and plug it into the correct port. Solution: Select Sound from System Preferences, and click on Sharp Aquos in the device list. Solution: Select Hardware and Sound from the Control Panel, click Manage audio devices in the Sound group, select Digital Audio (HDMI) in the device list, and click the Set Default button at the bottom. 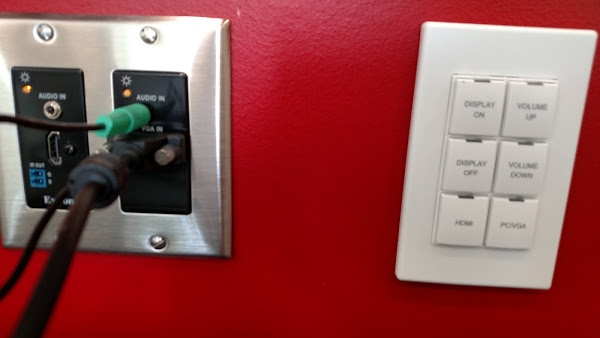 Solution: Unmute and/or turn up the volume on the TV using the volume buttons on its white control plate or, for the ceiling speakers, on the control panel. Solution: Press the Display ON button on the white control plate under the TV. Solution: Press the Input button on the side of the TV until HDMI 3 is selected. Additional troubleshooting tips will be added as reported.